John Joseph Farrell was born on November 5, 1932, on Staten Island, New York, one of three sons of John Farrell and Mildred Dwyer. He was baptized on November 20, 1932, at Our Lady of Good Counsel Church, Staten Island, and attended the parish school and Augustinian Academy. Upon graduation, he was received into the Order as a novice on September 9, 1950, and professed simple vows on October 1, 1951, at Good Counsel Novitiate, New Hamburg, New York. He attended Villanova University and graduated with a BA in Philosophy in 1955, having professed solemn vows on October 1, 1954. John pursued theological studies at Augustinian College, Washington, DC from 1955 to 1959, and also did graduate studies in Mathematics and Physics at the Catholic University of America. He was ordained to the priesthood on June 6, 1959, at the National Shrine of the Immaculate Conception, Washington, DC, by Bishop John McNamara. He completed an MA in Mathematics at Villanova University in 1962. Father Farrell's first assignment in 1959 was to Archbishop Carroll High School, Washington, DC, where he taught and was Dean of Students. From 1964 to 1967, he was assigned to Augustinian College, and began Doctoral Studies in Economics at the Catholic University of America, while a teaching assistant there. From 1967 to 1980, he was assigned to Biscayne College, Miami, Florida, where he taught Economics and was Director of Job Placement and Academic Advisement. He also completed his PhD in Economics in 1972. From 1975 to 1980, he was President of the college. 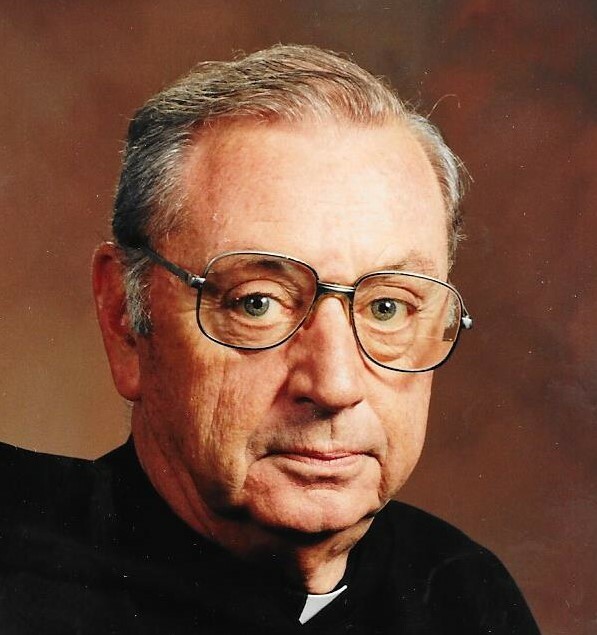 In 1980, Father “Figgy” Farrell, as he was commonly known, was assigned to Saint Thomas Monastery and worked as Associate Director of Development for Villanova University. From 1980 to 1982 he was assigned to the Provincial House, Villanova, Pennsylvania, and continued his work at Villanova University. In 1982, he was reassigned to Saint Thomas Monastery and continued his teaching and working in the Development Office of the University. Although he formally retired from the University's Office of Development in 1993, he continued his teaching in the Economics Department and the Business School, as well as assisting the University in its development and fund raising efforts. Father Farrell experienced poor health in his latter years. He died at the Arista Care Center in Plymouth Meeting, Pennsylvania on October 5, 2012. His funeral Mass was held Wednesday evening, October 10, at PM at St. Thomas of Villanova campus church. He is buried at the Augustinian Plot at Calvary Cemetery, West Conshohocken, Pa. Newer PostJohn F. Blethen, O.S.A. Older PostThomas P. Fogarty, O.S.A.